Which Dirt Bike - MX or Trail? 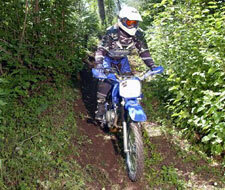 There are four basic types of dirt bikes - dual-sport (aka enduro), motocross, trails and trials. When deciding which dirt bike to buy a large part of the question will be pre-determined by your available riding area. 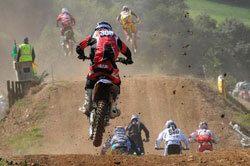 If you'll be riding on a motocross track, lean towards a motocross bike. If you have access to trails, go for a trail bike. You may be thinking a dirt bike is a dirt bike, but each bike is built for a specific purpose, and the one size fits all doesn't work very well when it comes to dirt bikes. Trail bikes are the cross-country runners and are built for distance travel, not quick laps around the track. They have a softer suspension because you'll be spending more continuous time in the saddle, and the stiff suspension of the motocross bikes would be really uncomfortable after a few hours. They also don't need as stiff a suspension because the trails generally don't have as many jumps, and the jumps are usually smaller and crossed at a slower pace than the jumps on a motocross track. Trail bikes have a larger gas tank because you'll be away from the parking lot or trailhead for most of the day. They have larger radiators, and some bikes have headlights, which can come in very handy if the ride goes longer than expected and it starts getting dark. The acceleration of the trail bikes is not quite as abrupt, and they don't need to be ridden full throttle the entire time. The transmission is designed so you won't need to shift every millisecond as you sometimes need to do with motocross bikes. Most trail bikes come with electric start which may sound unimportant but after you've stalled a few times on a steep hillside, you'll start to appreciate the e-start. To say trail bikes are better behaved than motocross bikes makes them sound wimpy which they're not, but they're definitely easier for beginners to ride out on the trails than the MX bikes. If trail bikes are the cross-country runners, then motocross bikes are the sprinters. They're designed for short, intense bursts of accelerating and braking. They're lighter in weight and the suspension is set up to handle the many jumps on an MX track. They'll sometimes almost make you swallow your tongue if you're not paying attention and hit the gas too hard. Lots of fun to ride once you get used to them, but they can be more difficult for beginning riders to master initially. They also have a tall seat height which can be a bit of a problem for shorter riders. Not all motocross bikes have electric start so the tall seat height can make it tough to get the bike started when you stall. There are a couple of things you can do to lower a dirt bike such as shaving the seat, installing a lowering link or re-setting the sag, but wait until you've ridden the bike for a while before making any changes. Some guys (mostly experienced ones) ride motocross bikes on trails, but the MX bikes have some drawbacks on the trails. It sounds dumb, but there's no kickstand. The gas tanks are smaller, they don't have lights, the suspension is very stiff, they're meant to be ridden at full rev, and there's no spark arrestor, which is usually mandatory if you're riding on public trails. You can add some modifications to make the MX bikes more trail-friendly, but it may not be worth the expense unless you can do the work yourself. A few time-tested mods are changing out the stock pipe, installing a flywheel weight, and/or changing the rear sprocket. Since this is a beginner's site, that might sound like Greek to you but at least now you can do some more research. Even if you end up buying a trail bike, riding a few laps on a motocross bike should definitely be on your Things-To-Do-Before-I-Die list. Riding motocross is an absolute blast!